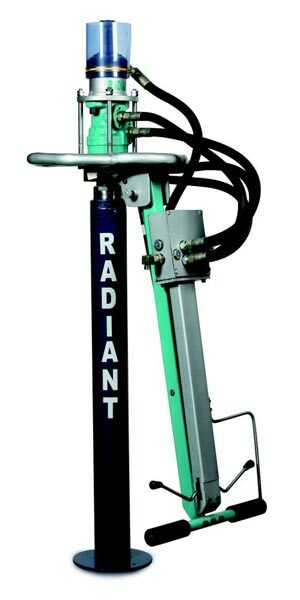 Radiant Portable Hydraulic Roof Bolting Machine is a rotary roof bolting machine with dust suppression system suitable for drilling vertical holes of 27mm to 43mm diameter & anchoring of roof bolts in underground mines in strata hardness up to 750 kg/cm2. It is totally indigenous equipment with modular construction consisting of 3 main assemblies- drive unit, telescopic leg, and control arm. It can run with tapping from any underground hydraulic machinery like SDL’s, LHD’s, Road Headers or preferably by an independent power pack. The machine has all operational controls on the handle of the pivoting arm itself which can be pushed down near the leg where it is automatically locked facilitating easy transportation. 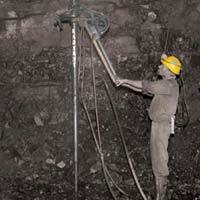 During operation it allows total control as well as safety to the driller. Easy maintenance & lowest service cost. No electric connection required to be taken upto the face. Water injection system helps in flushing cuttings, dust suppression & faster drilling. Unique drive head design eliminates thrust load being transferred directly to the motor. 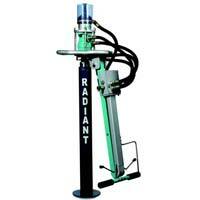 Portable, light in weight, easy to handle, can drill nearest to the face where space is limited. Length of Hole Upto 3 Mtrs.